Any suggestions about an essential item that must go with me (other than a binocular) and can be purchased this weekend? Thanks in advance. 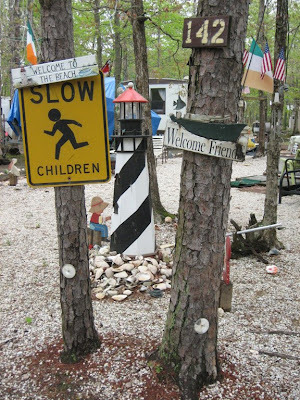 Hie yourself over to Wanderin' Weeta for a delightful party at Uncle Merl's! This edition of the biweekly birding carnival includes more than 20 contributors; will you participate in the next one? Submissions are due on June 10 to Carrie. Where do dead birds go? In Sunday's The Washington Post, Three Wise Guys share some wisdom. Where do birds go to die? There are millions of them, and yet we don't see carcasses lying all over the place. I mean anywhere. The only dead birds I see are the unfortunate ones who tempt fate by eating food off the road. Any ideas? Joe: Bird deaths are actually quite rare. The ones that die are either killed by hunters, charred by power li nes or line-drived by the occasional pro golfer with a vendetta against noisy red-shouldered hawks. (Yeah, I'm talking about you, Tripp Isenhour.) But birds dying naturally? It's almost unheard of. Most of the birds that you see flying around are thousands of years old. Justin: Why is Joe even allowed to answer questions? Not surprisingly, bird experts have a different take on this. According to Miyoko Chu of the Cornell Lab of Ornithology, "scavengers such as crows, raccoons and cats are constantly on the lookout for an easy meal, and they often find dead birds before we do." The size of birds also is a factor. "Small birds can be hard to see when they're lying on the ground around grass, trees or other vegetation, so even insects may consume a small bird before a person happens by," Chu says. In fact, dead birds (and even live ones) are so difficult to locate that scientists use birders to help track populations in order to estimate the number of annual avian deaths. Each year "hundreds of millions of birds are estimated to die after crashing into windows, and 100 million are estimated to be killed by cats," Chu says. And that doesn't even take into account the much-harder-to-document natural causes. Joe: I have a parrot that is 900 years old. "Drugs, prostitution threaten wildlife refuges"
CNN.com put an attention-grabbing headline on an article related to yesterday's post. 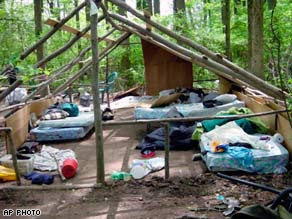 A decrease in law enforcement has left the refuges vulnerable to criminal activity, including prostitution, torched cars and illegal immigrant camps along the Potomac River in suburban Washington, methamphetamine labs in Nevada and pot growing operations in Washington state, Hirsche said. Willing to contact your political representatives in D.C.? Visit yesterday's post for the links to find your Congressional officials. 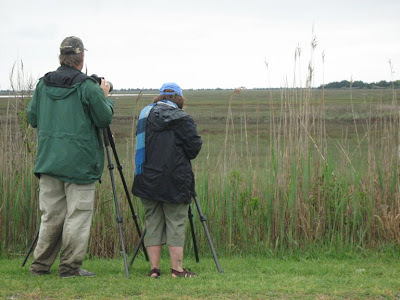 Birders age 18 to 23 who want to attend the annual American Birding Association convention in late June can apply now for a $650 scholarship. 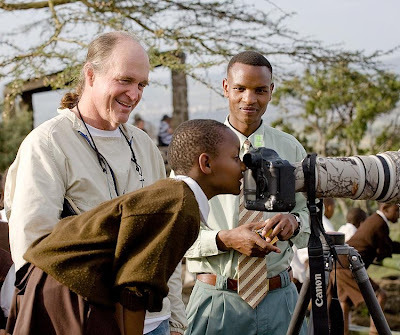 The convention, to be held at Snowbird outside of Salt Lake City, Utah, will include field trips, workshops, special presentations and social hours, giving young birders many chances to meet leaders in the community, including keynote speaker Julie Zickefoose. For scholarship details, contact Brenda Gibb at 800-850-2473 x230 today. 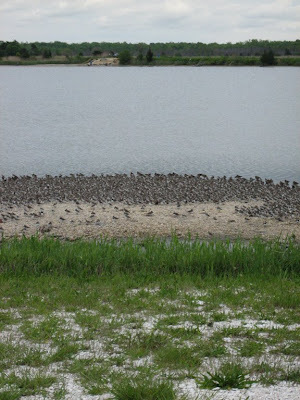 Do you bird in a national wildlife refuge? If you said "yes," then read on. Consider taking action, too. 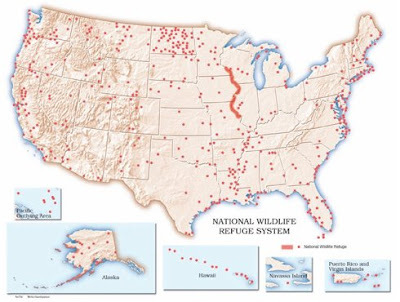 According to the Cooperative Alliance to Refuge Enhancement, our national wildlife refuges require at least $765 million each year to operate adequately. 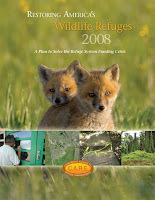 The refuge system currently receives only $434 million per year – an average of just $4.34 per acre. Click here to see how lack of funding has affected refuges in your state. Then consider contacting your state senators and representatives in Congress. If you don't speak for the birds and the habitat that they need, who will? The fifth annual Women in Conservation Luncheon yesterday included Audubon's Rachel Carson Awards, emceed by actress Sigourney Weaver. Carson wrote "Silent Spring" and has inspired many environmentalists since the book's release in 1962, and the award bearing her name "recognizes women who have demonstrated great leadership and commitment to conservation," according to National Audubon Society. This year's award winners include Teresa Heinz Kerry, Bette Midler and the founders of the Women's Committee for the Central Park Conservancy. The first two winners posed with Weaver upon arriving at the Plaza. Kerry received recognition for The Heinz Center, named for her late husband, Sen. John Heinz III. The nonprofit center focuses on environmental policy and partnerships between government, business, environmental organizations and academia. The founders of the Women's Committee for the Central Park Conservancy created the means to raise more than 20 percent of the conservancy's $27 million annual operating budget. Jean Clark, Norma Dana, Marguerite Purnell, Elizabeth Barlow Rogers and Phyllis Cerf Wagner (deceased) founded the committee in 1983. Weaver's role as the emcee apparently stems from a childhood interest in birdwatching. She recently narrated "Planet Earth" and recently finished two films with an environmental theme, "Wall-E" and "Avatar". "In 'Avatar,' Weaver plays a botanist devoted to studying and protecting a new planet. While shooting the film in New Zealand, she became fascinated with native birds and even more concerned with helping all bird species continue to survive," according to the NAS release. Sufficient protection for threatened race of Spotted Owl? The U.S. Fish & Wildlife Service released a recovery plan on Friday for Northern Spotted Owl (Strix occidentalis caurina). Developed over two years with help from scores of scientists, a recovery team of diverse experts, and an interagency group of biologists, the plan envisions recovery of the northern spotted owl could be achieved in 30 years at a cost of about $489 million. 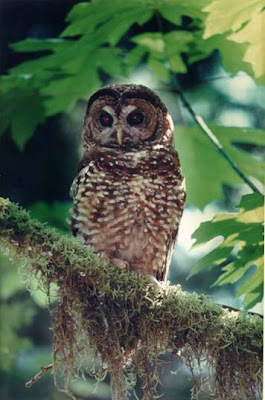 However, many of the actions in the plan are given only a 10-year lifespan, Lohoefener noted, due to the uncertainties associated with the threat from barred owls and the severe unpredictable risk of fire, especially in the dry eastern portion of the spotted owl's range, generally east of the Cascade Mountains' crest. Recovery actions will be monitored closely for effectiveness and revised if needed. American Bird Conservancy immediately pointed out concerns about the plan. To conserve the owl, the plan creates Managed Owl Conservation Areas (MOCAs) on 6.4 million acres which is significantly smaller than the existing system of reserves on 7.5 million acres created under the Northwest Forest Plan. While the MOCAs overlap with the reserves in many places, they provide 1.1 million acres less habitat protection, and do not include forests on the east side of Cascade crest. The agency may also be able use the creation of MOCAs to justify eliminating the existing system reserves. 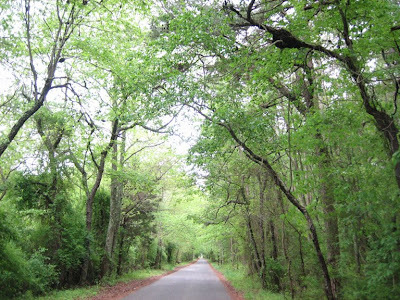 It also mentioned three other concerns and the Northwest Forest Plan. Did you miss yesterday's carnival, I and The Bird #75? I guarantee that if you cozy up to your computer this weekend with a refreshing beverage next to your keyboard, you'll find interesting posts at that link. The host, Amila in Sri Lanka, created a quiz based on the 26 posts, and answers can be submitted until May 29. The prizes: three beautiful books, certainly worth your time. Send your submission for the next carnival to Susannah by Tues., May 27. 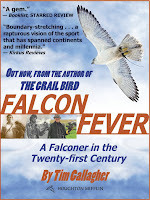 Birder/falconer/editor/Ivory-billed Woodpecker searcher/author Tim Gallagher flew into Southern California this week for three appearances to promote his new book, "Falcon Fever: A Falconer in the Twenty-first Century." I caught up with him Wednesday evening in Laguna Beach at Latitude 33 Bookshop on Ocean Avenue -- a delightful independent bookstore. Orange County, Calif., was Gallagher's stomping grounds in his younger years, and the group in the bookstore consisted largely of his friends, sister and colleagues. At the back of the store, in the children's section, Gallagher sat next to a table on which a mounted Peregrine Falcon remained frozen in flight. Gallagher read from the beginning of the book, which details his youthful interest in falconry -- encouraged by Walt Disney Presents' "Rusty and the Falcon" -- and his later trek in the footsteps of Frederick II, the 13th century emperor and falconer. He also answered questions about falconry and his overseas adventures -- including escapades with feral dogs in Italy -- and mentioned the ongoing efforts to document Ivory-billed Woodpeckers in the southern United States. I had to laugh as Gallagher recounted his first attempt to take an American Kestrel, using climbing spurs (to scale telephone poles) and rope to reach the top of an incredibly tall palm tree. He didn't succeed. Tonight, Gallagher will speak at the San Diego Museum of Natural History. Friday night, he'll return to Orange County and give a presentation for Sea & Sage Audubon Society. I liked that view particularly when the rain kicked in... again. 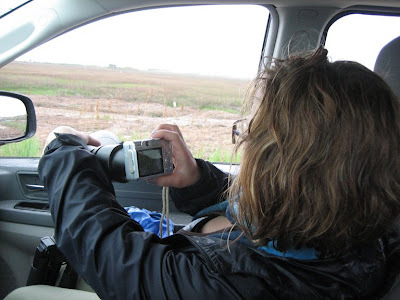 The intermittent wetness prompted some in-car digiscoping by Clay Taylor and Sharon Stiteler. 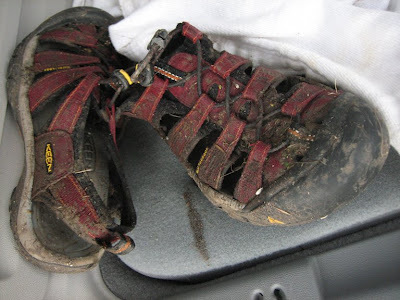 The soggy weather did not, however, prevent the digiscoping duo from pursuing their quarry by foot in saltmarshes. Out they went, in search of species and identifiable photos. And they smelled somethin' fierce. Believe me. This CNN.com article, "Women battle over dirty birds," made me laugh and sigh. On one side, Laura Dodson wants to reduce the amount of guano deposited by Rock Pigeons around Hollywood. The article says guano can corrode metal; I had no idea. On the other side, Susie Kourinian dumps 25-lb. bags of seed at various locations around Tinseltown. "Kourinian once told police she spends $65,000 a year on bird feed -- enough to dump 500 pounds of birdseed every day, a lifeline for the more than 5,000 pigeons who now populate the two square miles of this neighborhood northwest of downtown Los Angeles." Stephanie Boyles, a wildlife biologist with the Humane Society who has developed pigeon control programs around the country, said she's never seen anything like it. To get a sense of how bad the problem was, she once scattered some bread in a Hollywood parking lot. Within moments, the bread was gone and thousands of eyes were upon her. An eerie cooing suggested they wanted more. "I've traveled in Europe, I've been to New York City many, many times, Washington D.C. and Chicago ... places that claim to have pigeon problems. They do, but compared to Hollywood, it's not even a fair comparison," Boyles said. Dodson's efforts now include avian birth control: Ovocontrol P. It seems to be working and reducing the pigeon population -- and the amount of guano. Saturday, 5 a.m.: Birdchick (aka Sharon Stiteler) and I met up with Clay Taylor to begin a day of digiscoping in the World Series of Birding. Sharon and Clay provided the birding and photography skills of the Swarovski Digiscoping Hawks; I served as the chaffeur of their minivan. 5:30: We left our hotel, Avondale by the Sea, toward the first of many destinations -- where we found a closed gate across the entry. OK, so it was a tad early... but not by most birders' standards. During the next 14 hours, we visited various spots. How many of them can you identify? 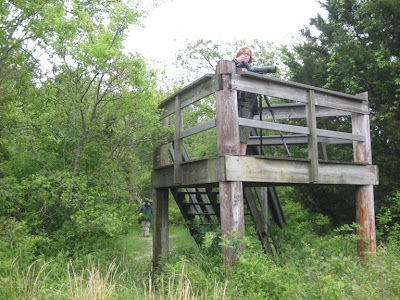 WildBird has the pleasure of sponsoring teams in two competitive conservation events each year: the Great Texas Birding Classic and the World Series of Birding in New Jersey. This year, our teams won their categories in each event. Woo hoo! In the Classic on May 3, the TAMUG WildBirders, from Texas A&M University Galveston and led by Susan Knock, won the upper coast tournament with 179 species identified in 24 hours. Here's the team's checklist. In the World Series on May 10, Zen Zugunruhe -- led by Dave Hedeen -- won the Cape Island category with 145 species in 24 hours. Here they are, reclaiming the trophy at Sunday's awards brunch. For the first time, I participated in the World Series -- as a driver for the Swarovski Digiscoping Hawks. 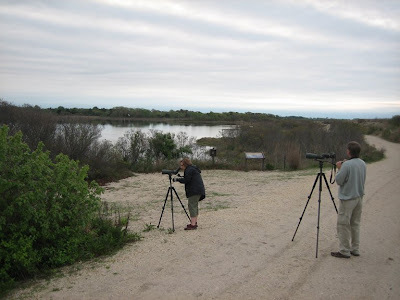 A last-minute invitation put me behind the wheel of a Chrysler Town & Country while Sharon Stiteler (aka Birdchick) and Clay Taylor of Swarovski Optik used digiscoping to photograph birds in southern Jersey. The duo turned in a checklist (actually, a PowerPoint slide show) of 113 species at the finish line and won the category. 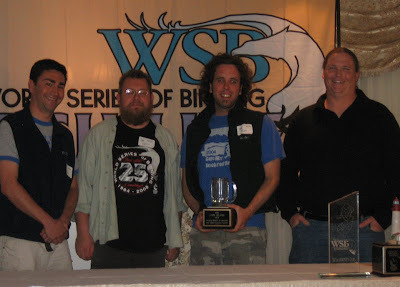 Congratulations to the award-winning birders! 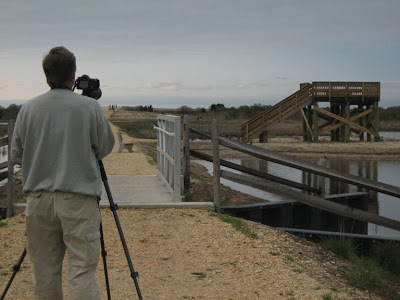 Many birders know Arthur Morris through his Birds As Art photography. I know him through his photographic contributions to the magazine and his role on WildBird's Advisory Board, where he offers tips, feedback and a delightful sign-off on his e-mails: "Later and love, Artie." Despite trading e-mail and talking on the phone for almost 10 years, I've not met Artie and had hoped to remedy that omission in February during the North American Nature Photography Association summit in Destin, Fla. Alas, our paths did not cross between his portfolio reviews, workshops and trade-show booth. I hope to have better luck in the future. In the meantime, I'll continue enjoying his photography. 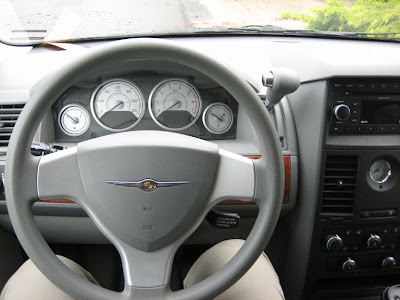 Please enjoy this blog-erview with Artie. 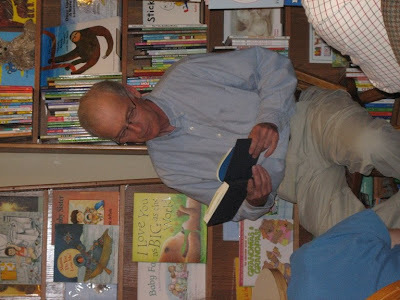 First off, Bob Elliot Kutner of the South Shore Audubon Society [Long Island, N.Y.] invited himself to do a program at PS 106, where I taught for 21 years. Elliot, a trip leader supreme with incredibly infectious enthusiasm, has been responsible for bringing birds into the lives of literally hundreds of folk. He planted the first seed. The Great and Snowy Egrets that fed in a tidal creek behind the pool club where I worked in Canarsie (Brooklyn, N.Y.) caught my interest. Next was the single Black Skimmer that mesmerized me after a night of fishing near the Plumb Beach Bridge in Brooklyn. It was, however, a single bird that -- unbeknownst to me at the time -- would change the course of the remainder of my adult life. I got in trouble by wandering off the path around the West Pond at Jamaica Bay Wildlife Refuge in Queens, N.Y., while tracking down an American Kestrel. A blue and orange falcon in NYC? Impossible. 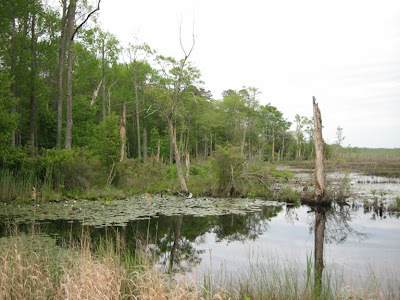 Ranger Bob Cook (who later became a good friend) suggested that if I wanted to walk with the birds that I visit the East Pond where there are no restrictions. On my first peek at the East Pond, I saw a large shorebird standing on the South Flats, bathed in early-morning light. 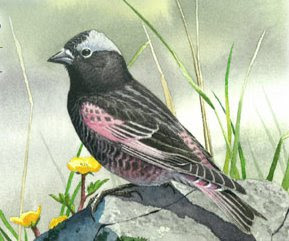 It had a really long, slightly upturned bill with a pink base to the bill. 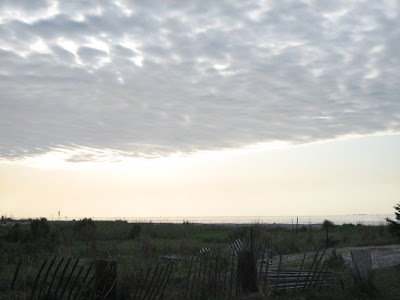 I heard the traffic roaring by behind me on Cross Bay Boulevard while the A-train thundered by just yards past the eastern border of the refuge. Jumbo jets blasted off right over the pond from JFK at a rate of about one per minute. 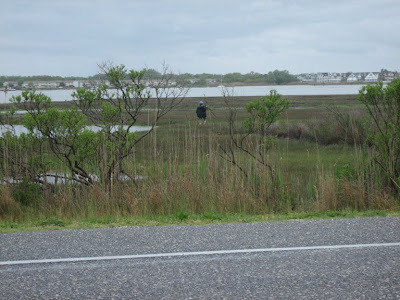 "None of the millions of folks traveling in the immediate vicinity of the East Pond have any idea that this bird is here or any idea of how beautiful it is," I thought. That Marbled Godwit was my spark bird, the one that changed my life much for the better. I bought my first telephoto lens, the Canon 400mm f/4.5, on Aug. 7, 1983. (I still have the receipt!) This coming August 7th will mark 25 years of bird photography for me. Yes. Male King Eider swimming in still blue water just after sunrise on a clear day... Went to Barrow [Alaska] just for that bird and struck out. What is your favorite piece of photographic equipment? My Canon 500mm f/4L Image Stabilized lens. Do you have a favorite location among the Instructional Photo-Tours? If so, where? 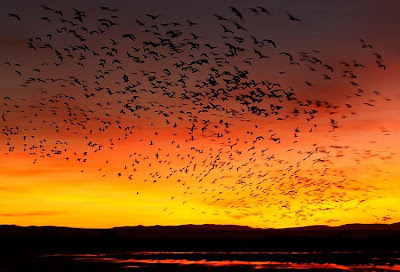 I first visited Bosque Del Apache NWR in San Antonio, N.M., with the love of my life, my late wife, Elaine Belsky-Morris. I re-visited Bosque just 10 days after her death on Nov. 24, 1994, and began what would be a long, slow healing process. Though I only do showers, I am a huge fan of rubber duckies. I actually throw a wash cloth over the drain so that mine has an inch or two of water to swim around in. What is your favorite group of birds to photograph? Shorebirds. They were the subject of my first book, "Shorebirds: Beautiful Beachcombers" (Stackpole Books, 2003 reprint). And I try to make it to the East Pond at Jamaica Bay Wildlife Refuge for the last set of morning high tides in August when the fresh juveniles are passing through. 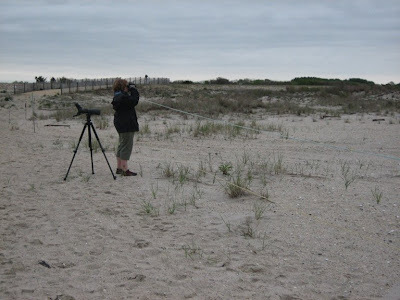 This may sound strange to some, but I do not spend much time around birders other than those I run into in the field or those I meet while doing programs for local Audubon or natural history groups. And the very great majority of those folks were--like me--kids many decades ago. I try to keep a few copies of "Bird Photography: Pure and Simple" (Tern Book Co., 1997) in my vest, and whenever I come across a youngster with a camera, even a point and shoot, I ask their name and sign a copy for them. In addition, I love to do viewfinder sharing with others, especially kids, letting them look through my long lens at this or that bird. Here' s an image of me doing just that at Baboon Cliffs in Lake Nakuru National Park, Kenya. 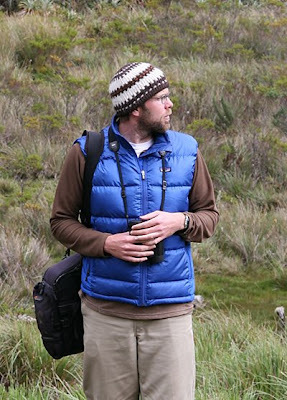 What was your most hilarious incident as a birder? Who do you consider the top bird photographers? Wow, you are trying to get me into trouble... Tim Fitzharris and Rod Plank (and John Shaw with his graphic style of flower photography) inspired me early on, and I have done a good job of emulating their styles: clean and graphic. Many of my absolute favorites are from overseas: Vincent Munier of France, Markus Varesvuo of Finland, and Andy Rouse of the UK (who is more of a wildlife photographer than a bird photographer). Describe your worst photography experience. Personally, I have never had any bad experiences. As a tour leader I did experience one fairly horrific event. We were on Hood Island in the Galapagos. We were walking back to the landing beach after a great afternoon photographing Waved Albatross. One of the participants, a woman slightly older than I, was walking not too far ahead of me. She was carrying a big lens on a tripod and had a short lens and a camera body on her shoulder. We were walking on medium-sized, jagged boulders. She lost her balance, tripped and began running in an effort to try and regain her balance, arms flailing all the while. After what seemed like an eternity, she fell face forward onto the boulders and hit with a huge thud. I thought that she might die right where she lay. What’s the single most important personal quality in a bird photographer – patience, technical skill, species knowledge, something else? Determination. When I left teaching in 1992, everyone told me, "You can't make a living photographing just birds." Best advice I ever got. I set out right then to prove them wrong and the rest is history... I do not see myself as very much more talented than the next guy or girl, but I sure have worked hard at what I do for a long time. You can learn more about Arthur Morris and his new book, "The Art of Bird Photography II "(916 pages on CD only) at www.birdsasart.com. Why would birders want to plant foliage that attracts bees? The little pollinators contribute to vegetation that provides food and nesting material for birds. If you'd like to make your patio or yard more attractive to winged creatures, peek at this Daily Green article. You can find more details about local native plants by doing a keyword search for "native plant society" plus the name of your state.